Join us for an exciting, activity-filled Costa Rica vacation based at our volcano rainforest resort overlooking the spectacular world famous Arenal Volcano. 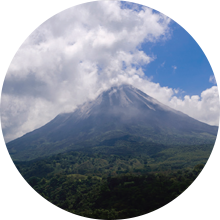 From the resort view spectacular volcanic eruptions as fire and lava spill over its upper slopes, here the natural beauty of the rainforest mergers with the magnificence of one of the most active volcanoes in the world. A Costa Rica Kosher Adventures tour includes much more than a hotel and food. We take care of every aspect of your vacation including all Glatt Kosher meals under strict supervision of the Centro Israelita of Costa Rica, on-site synagogue for daily Minyanim, airport transfers, 7-days of guided touring. What better way to experience the exciting eco-wonderland of Costa Rica. Just sit back and relax and let us take care of all of the details. A CRKA tour includes much more than a hotel and food. We take care of every aspect of your vacation including all glatt kosher meals under strict supervision, on-site synagogue for daily Minyanim, airport transfers, 7-days of guided touring. 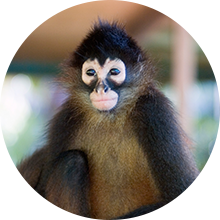 What better way to experience the exciting eco-wonderland of Costa Rica. Just sit back and relax and let us take care of all of the details. Activities include white water rafting, hiking, jungle and wildlife tours, river cruises, rainforest canopy / bridge adventures, volcano tours and just plain relaxing. $75/pp (cash, USD) for gratuities will be collected at the start of the program. Quad occupancy per room max: 2 adults per room plus 2 children ages 12 or under. Price includes: Lodging, full time CRKA guides/naturalist, daily transfers to activities, all activities listed above, all Glatt kosher meals under strict supervision, gratuities and all taxes & fees. Price does not include: Airfare, miscellaneous hotel charges and optional tours. Airfare: Please note airfare is not included in the price of your tour. Airlines that service Costa Rica are American Airlines, Delta, United and Avianca, Frontier, Spirit Airlines and Jet Blue. Please feel free to contact CRKA for help with airline information and ticketing. Travel Insurance: We require travel insurance or a signed opt out form for all of our travel programs. For more information or insurance registration forms please see our web site or call us for details. Accommodation: Our volcano eco-resort is an ideal place for rest and relaxation at the Arenal Volcano. The resort has been designed so that each room has a complete panoramic view of the volcano. The resort is close to many of the main attractions in the area yet maintains a silent tranquility surrounded by beautiful gardens, as well as a small stream, hot springs and old growth trees complete with walking trails. All rooms at the resort are spacious Junior Suite class rooms with volcano view and private sitting area. Rooms are equipped with two queen sized beds, air conditioning, satellite television, hot water, air dryer, telephone, coffee maker and mini fridge. Some rooms are designed for wheelchair access. The resort has an adult and child swimming pool as well as a jacuzzi and wet bar. Laundry service is available to hotel guests. All meals, activities and davening will take place at our private conference center complete with beautiful panoramic views of the volcano. Ask one of our travel experts to go over the program details to make sure that this tour is truly the right one for you. *Please note that the itinerary is subject to change at the discretion of the tour operator. day 1: arrival - Welcome to Costa Rica! Breakfast at hotel. 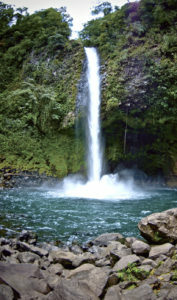 Visit Waterfall Gardens a lush tropical rainforest full of nature flora and fauna. Dinner. Orientation for next day activities. Overnight at Mountain Hotel Resort. Breakfast at hotel. Enjoy a day of adventure at Rio Sarapiqui. Dinner. Orientation for next day activities. Overnight at Mountain Hotel Resort. Breakfast at hotel. Enjoy views of the volcano walking on the hanging bridges. Afternoon volcano hike in rainforest trails. Dinner. Orientation for next day activities. Overnight at Mountain Hotel Resort. Breakfast at hotel. A thrilling zip line circuit located in the lush rainforest. Dinner. Orientation for next day activities. Overnight at Mountain Hotel Resort. Breakfast at hotel. Return to the city. Prepare for Shabbat. Friday night services and dinner. Overnight at Hotel Rincon del Valle. Breakfast at hotel. Join the local Kosher community for Shabbat Activities and meals. Overnight at Hotel Rincon del Valle. Breakfast at hotel. Transfer to airport according to your flight departure time.